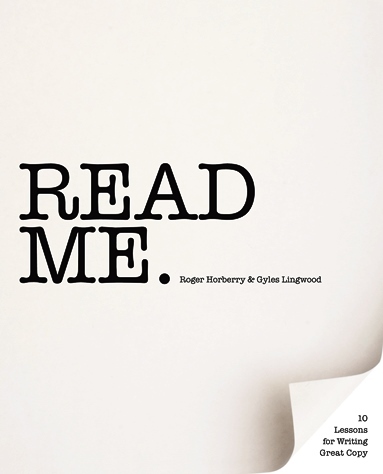 Authors Roger Horberry & Gyles Lingwood. Laurence King Publishing, released September 2014. 192 pages, 150 colour illustrations. Paperback, RRPM £18.95. This book takes a different approach from 100 Ways to Create a Great Ad, reviewed last time, but actually dovetails rather well with it. It’s especially good for the aspiring and junior copywriter, although, as ever, there are some tips for old hands too, and anyone who wants to succeed in creative communications will find it useful. The subtitle is “10 Lessons for Writing Great Copy” and it pretty much does what it says on the tin (to use a line from a Ronseal ad, and technique number 29 of 100 Ways). The authors are university lecturers, hence the structure. There are also numerous contributions from successful practitioners in the above-named fields, some well-known, others less so, but all with something thought-provoking and practical to say. The ten lessons include areas like mastering the basics, generating ideas, developing a style, writing for brands, selling not telling, your audience, a professional approach to working, and so on. There are also some practical workouts for readers in each section, which is a useful addition. Plus, of course, lots of lovely examples of good writing, and some great illustrations too. As befits a book which is about communications in a more general sense, it’s also very well art-directed. Interestingly, it occasionally uses the same examples as 100 Ways to Create a Great Ad, (for example Apple’s use of personality/personification), but in reality the two books complement each other well, with not much overlap. I like this book a lot. When I started out in advertising countless concepts, many rewrites and a few triumphs ago, it was above-the-line that attracted me and most of my contemporaries to the business. It was a golden age of advertising; there was a lot less below-the-line around and it was all seen as a bit below-the-belt by most. Nowadays, you need to be a good all-rounder to succeed, and the talk is more of online, offline or through-the-line – or simply no line at all. That’s why a book like this is invaluable, covering as many different fields of fields of communication as it does. If you’re starting out, or going freelance (where it’s always helped to have a variety of different pens in your pocket, so to speak) it should be required reading. Please get in touch if you need a freelance copywriter, whether for writing your advertising, your website, or your sales letter. Follow the links for details, or contact me. This entry was posted in Copywriting and marketing book reviews and tagged book review. Bookmark the permalink.